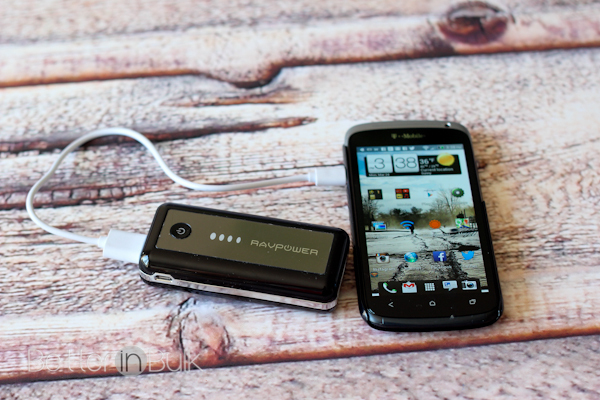 Note: I received a RAVPower Element 5600mAh External Battery Pack to review. All thoughts and opinions are mine and my daughter’s. If you’re like me, then you probably have your phone on you at all times. I realize that not everyone is on email and Twitter and Facebook and Instagram quite as much as I am, but from what I’ve seen of teens these days…I am a moderate user! My oldest daughter, Kim, has quite a busy daily schedule. Between school, internship and work, she’s always on the go…and rarely next to an outlet to charge her phone for any amount of time. She was frequently getting to the end of the day, finishing off a dinner shift at the restaurant, and finding that her phone was dead. Often, her phone would die long before her shift even started. It all depended on the type of use her phone was getting that day. Earlier this week, I headed out of the house for a late morning event. My phone was fully charged when I left the house, but by the time I was on my way home just after lunch time, my phone was on 15% battery. If I hadn’t headed home right then, my phone most certainly would have died. Whenever I am away from the house (and the WiFi) and my phone is searching for 4G, I lose battery power so quickly. And to add to the problem, when I’m away from the house, I tend to take more photos (and upload those photos to Instagram, of course). It’s all a perfect recipe for a dead phone. I’m sure that our scenarios are familiar to many of you. If you plan on using your phone for any type of social media (or email…or pictures…) then you can expect your phone to die within a few hours. Power outlets are not always handy, especially in those situations where it’s most common for our phones to die. And so we turn to external battery packs. I have used several external battery packs over the years, and my biggest concern has always been the amount of POWER the battery pack and HOLD – ie, how much of a charge will it be able to give my phone? I like that it has lights that indicate not only that it’s turned on, but how much battery charge it has left. I love that it uses the same charger as my phone, so I don’t have to keep track of multiple cords. I love that I can recharge the charger and use it over and over again…and always have it as back up power! Her only wish was that it would hold a charge for even longer (maybe for multiple phone charges?). A girl can dream! Do you find yourself wishing you had an external battery pack? 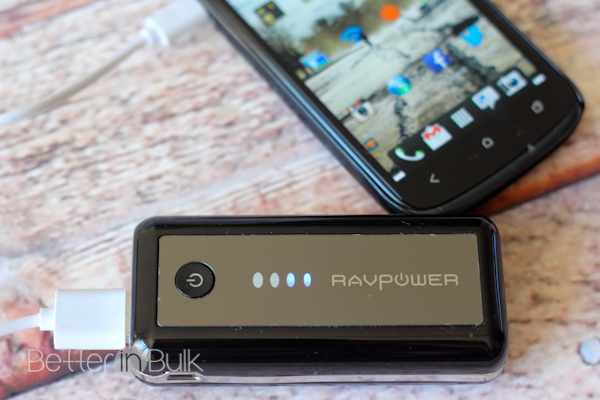 Check out the RAVPower Element 5600mAh External Battery Pack! See all of the other products available from RAVPower. My husband and I use the same charger style so in the car we have room to charge one phone at a time.. and of course both will need a charge at the same time. This would be perfect but is it rechargable itself? Or is it once it is used up it is done?